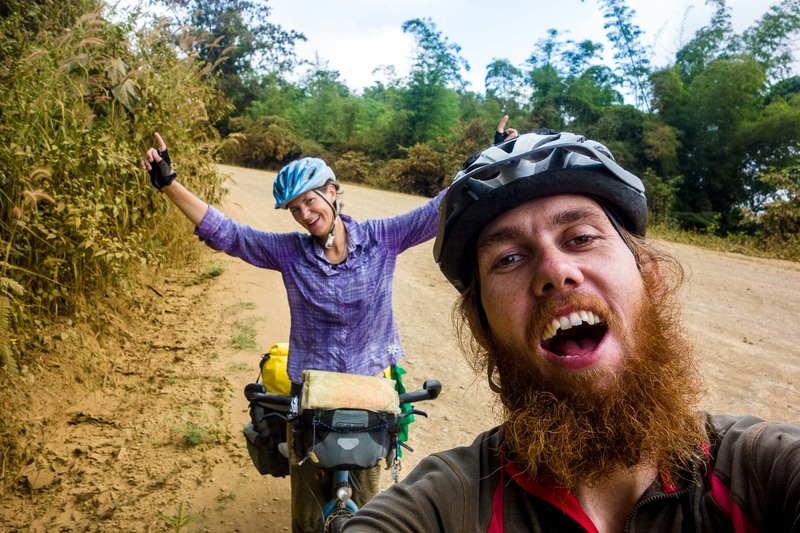 After more than 11 years (Martin) and 8 years (Susanne) since we separately visited Laos as backpackers, we are now back again only this time together and by bicycle. Returning to Laos by bicycle has already given us new insights to this little country where communism is the base of the country. Crossing the Mohan – Boten border was unexciting and turned out to be the simplest border crossing ever. Parked the bicycles outside the Chinese immigration got our passport stamped, walked back out and cycled to the Lao border where we paid for the visa and got the visa in 5 min. We had an early lunch in Boten, where we were expected to pay with Chinese RMB as most people are Chinese. The last 6 months have been spent in China, Korea and China again. Unaware to us our minds and thoughts had slowly become numb and accustomed to the culture. Developed Korea and the availability of most things in China have influenced the way we see the world and we were in need of a change of environment and definitely received this passing the border to Laos. Just out of Boten and into Laos we went past 3 elephants waiting for Chinese tourist to hike on them… They didn’t look super happy but again who are we to say? Maybe the elephants are fine there. Soon we were cycling through small villages where most houses are built from bamboo and elevated from the ground. This was a real surprise that Laos is so rural so close to China where cities are concrete and villages are becoming more and more concrete. We were greeted with “Saabai-dee” from the people along the way and children running to the street. This reminded us a little bit of the children of Tajikistan where kids would also run to the street to greet us. We noticed that most cooking is done on open fires in the small bamboo houses which was a real surprise as even Tajikistan, Mongolia, rural China have inexpensive stoves where they cook on. So in a very short time we really felt that we had stepped back in time and seeing the challenges Laos has standing in front of them. The road continued up and down just as in Yunnan, China and camping spots not easy to find. After a day with continuous showers as the wet season is not over yet we found a small bamboo hut in the corn fields where we could set up camp and shelter from the rain. Here in Laos people live from the land and it seems that the land is very fertile as either there is jungle or a field. Everything is green and growing fast. Does this fertile land impact people in a way to develop their skills less we were thinking? 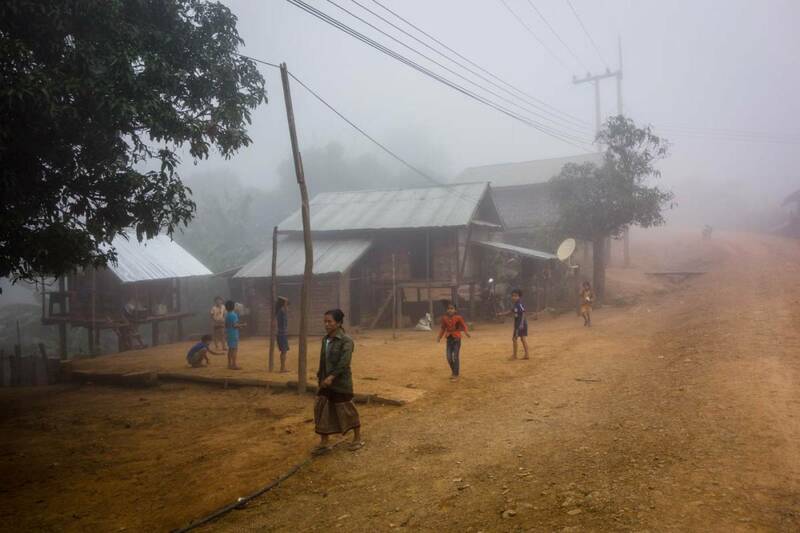 Having been to Laos before and having seen speed of development in other countries it surprised us that these villages and areas were still basic. 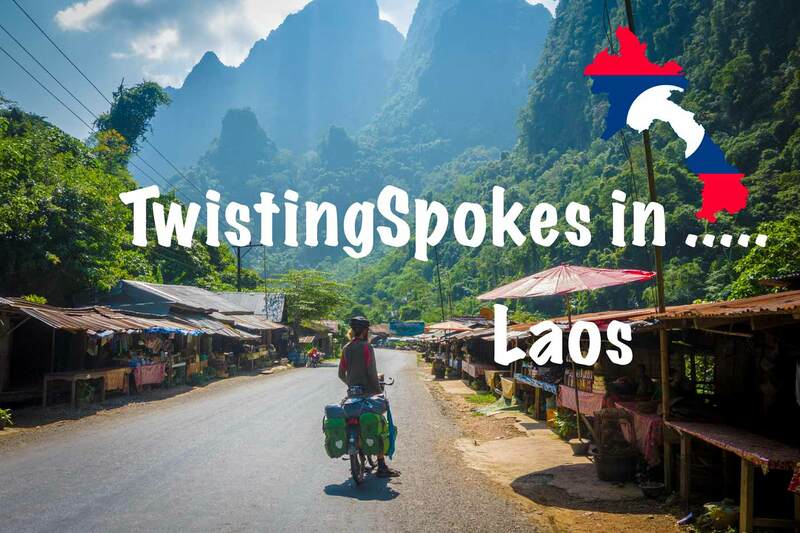 Well for sure there are many questions in Laos to be asked and we are not sure who to ask? Passing villages where people seem happy with the life they have even though they live very low tech. Well they all have satellite TV and off course we have seen many smart phones. This we have seen before TV and smartphones getting priority in many communities before clean water and sanitary installations. This is not only here in Laos but has been a clear path since we left Europe. Laos really has made an impression and is making us reflect more on some of these questions which have been apparent to us for a while. It has been keeping our mind busy trying to look at situations without a western bias and coming from a different culture. Now we were thrown into the life of rural principles and made it more clear to us. To compare or reflect, we think back at high tech South Korea and try to look for the development differences. South Korea has abolished most of old traditions “WIKI” and gone 100% for development and consumerism to drive their country. Is this better?? Not sure but we can learn from both. This contrast is so immense and almost unbelievable for us that there can be such big differences between humans, their background, culture and the personal initiative. This is a subject we do talk about and also try and speak with people along the way to find the differences. Cycling though was very muddy and with beautiful scenery. For the second night we found a small guesthouse where we could sleep for 8$ which was very simple but fine for the night. We had a nice noodle dish for dinner from the only restaurant in the town. 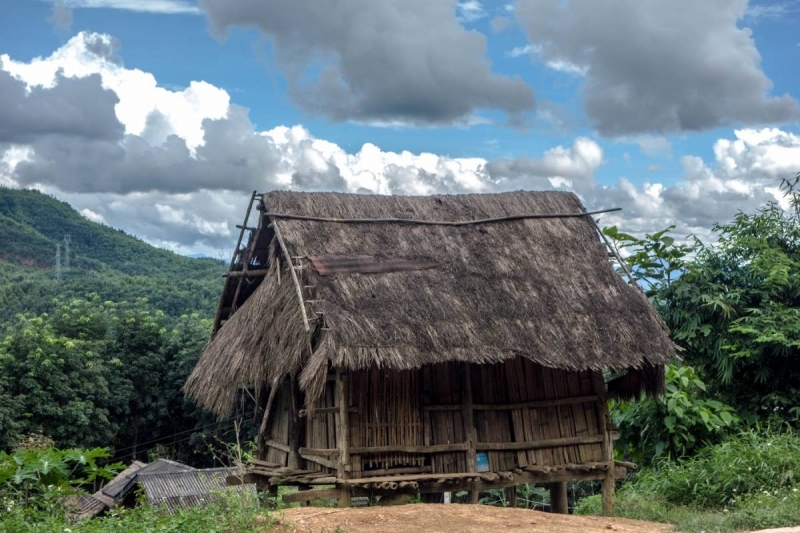 We were getting close to our first stop here in Laos, Nong Khiaw that has developed the last decade for tourists. 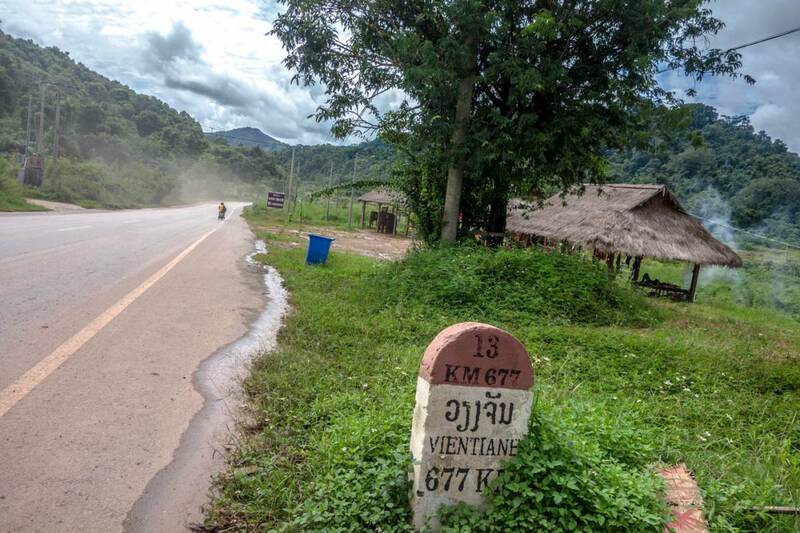 The road to Nong Khiaw follows the Nam Ou and has nice limestone mountains in the distance. We enjoyed the ride to Nong Kiaw through some small villages with local markets. Nong Khiaw is where we are now and here we have been resting for the last few days. Trying to gain back some weight that the mountains kept and reflect on the last months of cycling. We have been staying in this little bamboo hut on the river bank with a hammock and no wifi and this has proven to be perfect for some days rest. Nong Khiaw is definitely on the backpacker trail of South East Asia, this means that we can find a nice variety of food and snacks which we need. Next stop is Luang Prabang where we have both been before, so will be interesting to revisit and see how it looks today. Hi Martin & Susanne; great you’ve made it back to Laos and the pics tell a thousand words 🙂 Thanks for the postcard which I received last week where you wrote from Dali in Yunnan and your cycling artwork is better than mine. Did you get the wheel rim fixed? Since you were in Dali you have cycled 850 km to get to Laos so that’s about 500+ miles and on a dodgy wheel rim under weight that’s pretty good. I envy you both, but at the same time know how tough it can be on the road like this day in day out. You can’t stop now.